Teaching Authors--6 Children's Authors Who Also Teach Writing: Science Poems. Poetry Month. Poetry Friday. Oh, My! Science Poems. Poetry Month. Poetry Friday. Oh, My! 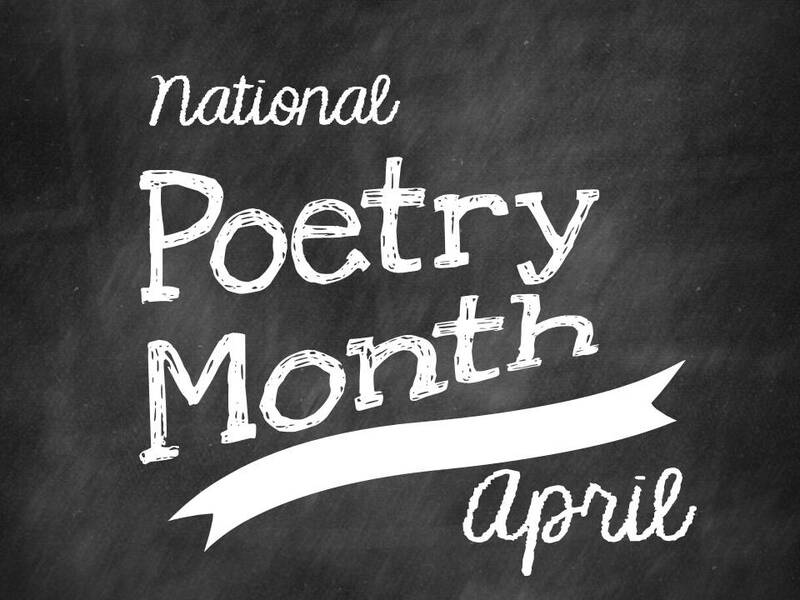 1) Today is the first day of National Poetry Month, which is celebrating its 20th anniversary! 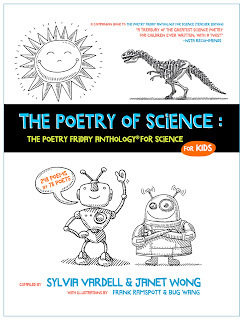 2) Today I'm sharing "a treasury of the greatest science poetry for children ever written"! Lions and tigers and bears--oh, my! Joy Acey, Alma Flor Ada, Linda Ashman, Jeannine Atkins, Carmen Bernier-Grand, Robyn Hood Black, Susan Blackaby, Susan Taylor Brown, Joseph Bruchac, Leslie Bulion, Stephanie Calmenson, F. Isabel Campoy, James Carter, Kate Coombs, Cynthia Cotten, Kristy Dempsey, Graham Denton, Rebecca Kai Dotlich, Shirley Smith Duke, Margarita Engle, Douglas Florian, Betsy Franco, Carole Gerber, Charles Ghigna, Joan Bransfield Graham, Mary Lee Hahn, Avis Harley, David L. Harrison, Terry Webb Harshman, Juanita Havill, Esther Hershenhorn, Mary Ann Hoberman, Sara Holbrook, Patricia Hubbell, Jacqueline Jules, Bobbi Katz, X.J. Kennedy, Julie Larios, Irene Latham, Renée M. LaTulippe, Debbie Levy, J. Patrick Lewis, George Ella Lyon, Guadalupe Garcia McCall, Heidi Mordhorst, Marilyn Nelson, Kenn Nesbitt, Lesléa Newman, Eric Ode, Linda Sue Park, Ann Whitford Paul, Greg Pincus, Mary Quattlebaum, Heidi Bee Roemer, Michael J. Rosen, Deborah Ruddell, Laura Purdie Salas, Michael Salinger, Glenn Schroeder, Joyce Sidman, Buffy Silverman, Marilyn Singer, Ken Slesarik, Eileen Spinelli, Anastasia Suen, Susan Marie Swanson, Carmen Tafolla, Holly Thompson, Amy Ludwig VanDerwater, Lee Wardlaw, Charles Waters, April Halprin Wayland, Carole Boston Weatherford, Steven Withrow, Allan Wolf, Virginia Euwer Wolff, Janet Wong, and Jane Yolen. 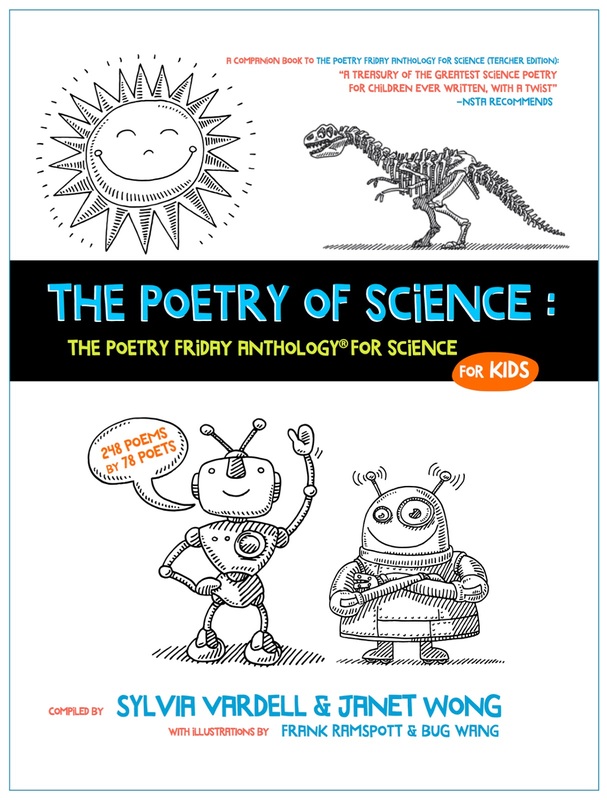 Teachers and parents asked us to make a Children's Edition of THE POETRY FRIDAY ANTHOLOGY FOR SCIENCE (Teacher Edition) with the poems grouped by theme--all the Ecosystems poems together, Lab Safety poems together, Math poems together, etc. (instead of grouped by grade level). So we did, and this is it--with 30 more poems than the Teacher Edition! Kids always ask me, "What is your favorite (of your own) books?" For now I have to answer: THIS ONE! Maybe because this one is the brand-new baby, or maybe because I think the illustrations by Frank Ramspott and Bug Wang really fit the text perfectly. I hope you agree! If you were Janet and Sylvia, wouldn't you swoon when you read that review? Ben Franklin loved the poem about him—thank you for your poem “Discovery," X.J. Kennedy! In fact, he loved the whole book and got very excited when we gave him a copy—so excited that he handed his phone to a security guard, asking him to take a photo with his phone, too. When I flipped through to find a poem I wanted to share I ended up with a list numbering a million gazillion favorite poems. I finally threw my hands up in the air, closed my eyes and threw a dart into my list. The dart hit Steven Withrow's marvelous poem. Steven, will you please introduce your poem? Sure! Science, I've learned from working for many years with scientists and medical researchers as a journalist and editor, is a kind of poetry. To communicate science is to use the language of metaphor and symbol, as well as persuasive sound and rhetoric, and it's no surprise that many scientists also write poems. "What Makes a Turbine Turn" was inspired by the massive wind turbines being constructed close to my house in New England. I hope my turbine poem captures a hint of this pleasurable otherness. Copyright © 2016 Steven Withrow. From the book The Poetry Friday Anthology for Science. Pomelo Books. Reprinted by permission of the author. Wow. The thing that strikes me about this poem is that I see how wind moves...and I am moved, too. Thank you, Steven! Campers, if you were to write a children's poem about something in science, what topic would you choose? And don't forget: if your work is in this anthology, let us know! Thank you, dear Amy at The Poem Farm, for hosting PF today! What a wonderful poem. I love how it explores all of the things the wind can be. I'm partial to that plastic-bag ghost -- such a great visual. What an effortless build of energy there is in this poem. I too like the image (and rhythm) of the plastic bag ghost. And can only imagine the awesome topics/poems that must make up the collection. What a wonderful poem with its movement like the wind itself, moving swiftly from image to image. I lie rotors rhyming with motors. The poem has that quality of feeling so right, it just had to be written. I want a copy! I love every bit of your excitement for April, not surprised, and Stephen's poem offers wind a new image, despite its "formless force". Thanks, April. I like the exploration too--the breezy move from place to place just like the wind. CB ~ In fact, my mom and dad named me after the Ogden Nash poem, "Always Marry an April Girl"! Laura & KatsWhiskers ~ I'm partial to that plastic bag image, too! And it does feel like an effortless poem, doesn't it, KatsWhiskers? The mark of a true craftsperson. Brenda ~ yes, yes as you say: "The poem has that quality of feeling so right, it just had to be written." Linda B ~ My mentor always said that you want to create a fresh image...Steven sure has! Liz ~ yes, his form and words feel like wind itself. Amy ~ We are so lucky to have Janet and Sylvia in our poetry universe! Dayenu indeed. This just proves that I--included in the anthology--have not spent enough time with it...I hadn't read this fine piece! It's very timely for a windy time of year, and Steven and all of us benefit from your highlighting this new version. Happy double April! Thank you all. I really appreciate your wonderful comments! What an amazing poem, Steven! The imagery and wordplay is fantastic— I'm simply blown away. ;) I will definitely be keeping this as a mentor text for myself. Thank you for sharing it, April! What a wonderful poem! My son-in-law works on a wind farm in northern B.C. so this poem has special significance. Wind is truly a marvel! Echoing praise for Steven's way with words - "shapes a ghost/from a plastic bag" - beautiful. SO grateful for this wonderful post, April--and all the poets who participated in this project!!! Happy Poetry Month, April (YOU! ), and happy ME to be included in this lovely post. Thank you for YOUR wonderful science poems and for helping us get the word out about this wonderful book. We love how poetry people are exploring science through this book and how science people are loving the surprise of poetry in the science area. Win Win! I have the teachers edition of the PF Anthology for Science, but will have to order the children's edition. I love the idea of these turbines being the wind's pinwheel! Thanks so much for sharing! were collected in one space! I have enjoyed reading so very much. Launch a weather balloon, spin a turbine! Stepehn's poem lifts me up - a perfect selection by chance of the lance. And April - totally a giggle that your parent's named you for the Ogden Nash Poem! A first in the Poetry Friday world, me thinks!!! 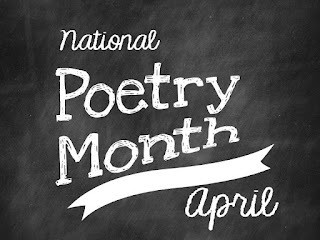 Happy National Poetry Month to every reader, writer & especially poem makers. Michelle ~ I'm glad you're planning to share this poem. I couldn't help it! Thank you, most prolific Robyn! Janet and Sylvia ~ you said it right: the surprise of poetry + science. That's exactly it! readingtothecore ~ thank you for reading our posts! Wow! The combination of April and Steven cannot be denied. WAYLAND and WITHROW POWER!!! !